In our travels we have amassed a wonderful collection of folksongs and popular songs from numerous countries, many of which we use as encores when we visit. In many cases the choice of songs has been very difficult to make, given the tremendous wealth of material. The influences and sources are extraordinarily far-ranging, and each song has its own local characteristics. This has made the selection process somewhat arbitrary, but these songs represent our own personal favourites, which we hope you will also love. Too many of these songs sit in our library until our next visit to the country. The tracks on the album will lead you on a tour of all the main territories that we regularly visit, from The Americas to Australasia, via Europe and Asia. Read more about Postcards in our Projects section. This song is thought to have been written by members of The Gaiety Theatre Company in London and Brisbane. The song describes the transport of British convicts across to Australia via ship and the awful conditions encountered. We had this song arranged for our trip to Australia in 2012. This Maori love song was written just before the First World War while soldiers were training north of Auckland, New Zealand. It speaks of the yearning for home that soldiers experience, and the lyrics have remained almost completely unchanged since then, proving its long-lasting appeal. This lovely version by Keith Roberts was written for our trip to New Zealand in 2012. This song comes from a set of five wonderful arrangements of folksongs from the Auvergne region of South West France. In the song two shepherds call to each other across a valley to say that all is well, and they can sleep in peace. Le Baylère is best known in the version by Joseph Canteloube, from his Chants d’Auvergne. This traditional song from the Canadian province of Newfoundland tells of a young fisherman who travels to Bonavista Bay to do a spot of fishing. Whilst there he meets a young lady called Sally. They smile at each other in church, and one thing leads to another, so that when he returns the following year, she has a little surprise for him. This well-loved folksong describes a journey through a pass through the mountains of Korea. It is unclear exactly where this pass is, but the song has become an unofficial extra national anthem for the country. This Italian song, whose title means ‘In the Sky, Painted Blue’, was written by Franco Milliacci and Domenico Modugno and won third place in the 1958 Eurovision. The song was written after a vivid drunken dream by Milliacci that placed colourful images in his mind. Perhaps better known as Volare, this song has been covered by many singers, including Frank Sinatra, Louis Armstrong and Dean Martin. ‘There is my sweetheart’ is a simple Finnish love song that tells of a man’s feelings of yearning for his beloved. The text comes from the extensive collection of Finnish folk poetry called Kanteletar, which has been a great inspiration to many composers, most notably Jean Sibelius. This passionate song by the Ecuadorean composer and violinist Enrique Espin Yépez was arranged for us by Miguel Esteban for our trip to Ecuador’s beautiful capital city Quito in 2013. The song tells of a man’s infatuation with a beautiful woman. Sadly his love is not reciprocated. This renowned Brazilian choro piece of music was popularised by the performance of Carmen Miranda in the film Cocopabana in 1947. The lyrics describe the cooing of the tico-tico bird and the wooing of women. We loved singing this for the audience at our concert in Rio de Janeiro in 2013 during our debut visit to the wonderful country of Brazil. This is a traditional hunting song in the German style, which likens the excitement and frustration of hunting to the successes and failures of love. 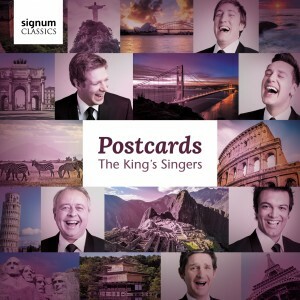 This is a long-standing King’s Singers favourite arranged by Gordon Langford. The Scot poet Robert Burns devoted the last decade of his life to preserving Scottish culture, and this song was written as he walked the country in 1794. The text is written in a traditional Scottish lilt, and the melody is simple and traditional. This is another long-standing King’s Singers favourite, in this version written by our founding baritone Simon Carrington. This lovely Danish tune from the 1600s was given this text in 1847 by N.F.S.Grundvig, which politicised an earlier version of the song. The poet describes the beauty of the Danish country, and says that no song is as sweet as one sung in Danish. El Vito is a traditional Andalusian folksong thought to originate from the sixteenth century. This lively dance was one of the arrangements written specially for this CD, and Miguel Esteban’s wonderful arrangement captures the excitement of this bolero-esque dance. Wang Luobin, an ethnomusicologist, wrote this melody after becoming inspired when he heard a Kazakh folk tune in 1938. This song, which speaks of the separation of a young couple, is one of the most well-known Chinese folksongs. First recorded in print around 1800, Suo Gan is a traditional Welsh lullaby. The text evokes images of slumbering children and murmuring waves on the shore, matched here by the tranquil arrangement of Robert Rice. Egoli is the Zulu name for the South African city Johannesburg, and translates as “city of gold”. The song describes life in the city, with both its joys and hardships. Egoli is one of six songs, entitled Lalela Zulu. This wonderful tradition of the American spiritual is loved the world over, and we certainly get a great reaction when we sing Keith Roberts’ fantastic arrangement of the lively spiritual. Esti Dal translates as ‘Evening Song’ and is Kodaly’s most famous choral work. A young soldier fighting for the Austro-Hungarian Empire prays to God for shelter and safe-keeping through the night. ‘My little green cactus’ is a comedic song first performed by The Comedian Harmonists, the great German harmony group of the 1920s and ‘30s. This has often ended our concerts in German speaking countries, and we are delighted to include it here to round off our collection of Postcards from around the world.